Something many people may not be aware of is the role the St. Augustine Alligator Farm Zoological Park plays in facilitating crocodilian research. Recent work involved renowned crocodilian expert Dr. Kent Vliet, Director of Biological Labs at the University of Florida and Dr. John Hutchinson of The Royal Veterinary College in England. Dr. Hutchinson is an expert in the biomechanics of terrestrial vertebrates. A fascinating aspect of working with crocodilians is that even though they have been studied for decades, there are still many mysteries to solve. How crocodilians move, or more specifically, how they run is one of these mysteries. Crocodilians utilize a wider array of gaits than most all other vertebrate families. Of all 23 species of crocodilians, the Johnson’s crocodile of Northern Australia is perhaps the most famous for its ability to maintain a true gallop, being the only species captured on film doing so. Previous to this study only a few other crocodilian species have been reported to use this style of locomotion for escape, many of these reports being anecdotal and without documentation. Two years ago, while doing a project on crocodilian bite force, Dr. Vliet believed he observed a startled dwarf crocodile utilizing a gallop as a method of escape. This sparked his interest in further study of crocodilian movement, and the possibility of documenting other species moving in this fashion. He contacted Dr. Hutchinson, who was then at Stanford University, to see if he would be interested in participating with this work. Dr. Hutchinson, whose previous work has included everything from Elephants to Dinosaurs jumped at the chance to add crocodilians to his list. The project itself turned out to be quite the production. Dr. Vliet and Dr. Hutchinson not only wanted to document these movements but also try to understand the mechanics of them. In order to accomplish this we needed to have the crocodiles run down a small corridor and over a pressure plate that would measure the amount of force exerted as the animal crossed. We also had two high speed cameras set up, one above the pressure plate and one to the side, in order to capture some slow motion shots of the action. The crocodiles were also painted with a series of white dots to mark certain reference points on their body. The amount of man power required to maintain all the different computer equipment (the pressure plate had its fair share of computers and monitors hooked up to it), cameras, records and crocodiles was a little overwhelming and soon started to resemble the classic circus clowns stuffed in a car. While the corridor was around ten feet long, the size of the pressure plate and window for filming was only three feet. Timing and distance became very important for us to capture the movement we needed, just as patience became very important for us to maintain sanity. It is safe to say that our persistence did pay off. Over the course of two visits and more than ten days of hard work and determination, Dr. Vliet and Dr. Hutchinson managed to document five species of crocodilians galloping. 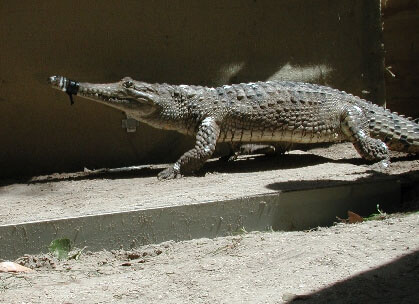 They were also able to collect movement data on several other species of crocodilians, making the entire project a success.